The week-long book street festival features nearly 60,000 titles of various genres. It has been held in HCM City for nine consecutive years, serving as a cultural attraction on the start of the new lunar year for local people and visitors, said Duong Anh Duc, Director of the municipal Department of Information and Communications. A corner of the Nguyen Hue flower street. A highlight of the festival is a showcase area, with a number of exhibitions on the 320th founding anniversary of HCM city, spring newspaper festival, and achievements in the city’s external relations in the previous year, among others. In addition, folk games and book releases will be arranged within the framework of the festival. 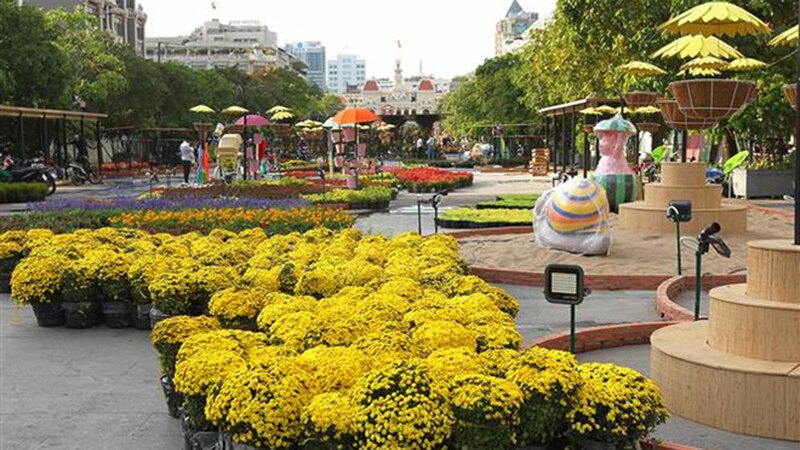 Meanwhile, up to 130,000 flower pots and baskets grown in HCM City and Sa Dec flower village of Dong Thap province are exhibited along the Nguyen Hue street. Speaking at the opening ceremony of the flower street, Vice Chairman of the municipal People’s Committee Le Thanh Liem said the festival turns to the 15th year. Both events run until February 8. The Ban Flower Festival will be held from March 13-18 this year in the northwest province of Dien Bien and featuring a wide range of activities, heard a press conference in Dien Bien Phu city on January 7. Low budget carrier Vietjet Air has announced its plan to offer a special service for passengers who wish to carry peach flowers and ochnaintegerrima via checked-in luggage on board of its flights during the upcoming Lunar New Year (Tet) holidays. Hanoi has commissioned artists to adorn its sidewalk electricity boxes, illustrating them with ‘12 flower seasons’. (BGO) – On the occasion of the upcoming New Year 2019, the People’s Committee and Women’s Association in Da Mai ward plan to organize a flower and culinary festival at Rose Garden Film Studio in Thanh Mai Residential Group, Da Mai ward (Bac Giang city). An annual festival centering around buckwheat flowers, the iconic flower of the northern mountainous province of Ha Giang, and the unique cultural values of local ethnic groups will begin on November 23.